So we have the Champion of the Champions. Chennai Superkings have done it. They played like Champions not only in the finals but throughout the tournament. They batted brilliantly, bowled brilliantly, fielded brilliantly. They are the deserving to winners. First IPL and now CLT20. It's super double for the Super Kings. 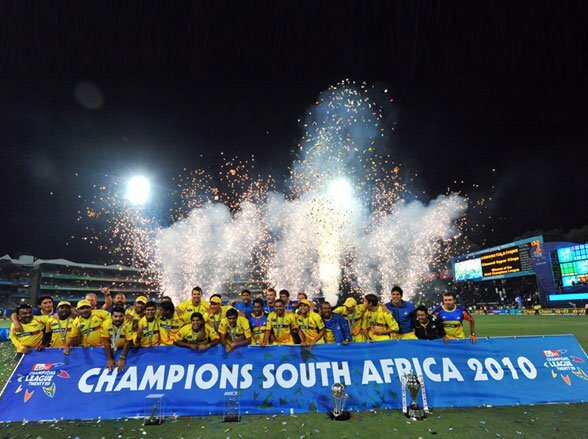 They are the first Indian team to win the Champions League T20 title. It shows that they are the best in the business. As they say Rome wasn't built in one day, it didn't happen in one day too. It's a result of continuous hard work, tremendous amount of self-belief and great determination. Everyone performed for them, whether it's trusted International players like Hussey, Muralitharan and Bollinger or local talents like Badrinath, Balaji or Aniruddha. Raina was awesome in all three departments throughout the tournament. Ashwin and Vijay continued their great IPL form. These are some great signs for Indian cricket. Hope someday they will be able to perform like this for the national side too. Skills and talent backed by some great leadership. Now, Dhoni is the only captain to win all three (World T20, IPL and CLT20) big T20 tournaments. Big credit goes to Stephen Fleming too. The way he has handled the team is truly incredible. After winning the IPL, if anyone had any doubts on this team’s ability, then Chennai Superkings have now showed them why they deserved to win the IPL. At a time, when other Indian teams were struggling to face the teams from Australia and South Africa, then only Chennai Superkings showed how to fight and win. Happy that Champions League T20 trophy is coming to India, sad that many players of this Champion side won't play together anymore after the fresh bidding. Warriors had a great tournament too. Even though they lost the finals, it doesn't mean they aren't a Champion side. As we know, someone has to win and someone has to lose, that's the way things go. Reaching the finals is an achievement in itself. If anyone has left a big impact in this tournament then it's none other than Davy Jacobs. What a player he is. Without any doubts I can say that if Pollard was a find of the last CLT20 then players like Jacobs, Finch, Ferguson and Klinger are the finds of this CLT20. This tournament was one of the finest in the recent times. We witnessed some great cricketing action from the beginning. Pollard’s 9 SIXES against Guyana, Raina’s 94 not out in the semis against RCB, super over in the CSK–Victoria match are some of the memorable moments of the tournament. Last but not the least, hats-off to South Africa for organizing yet another big sporting event so wonderfully. Champions League T20, I liked it.